China and now India have chimed in to support this call to move away from the dollar as the primary reserve currency. But the Russians have been the most vocal about it. Why? The can just as easily shift to the Euro as the primary reserve currency. Why make a big stink out of it? OPEC has been unable to get the oil price back up above $100. Demand just isn't there (as we discussed.) 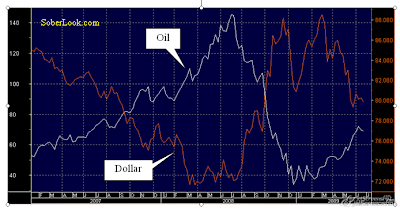 So talking down the dollar may create a nice spike in energy prices as we had a year ago. Russia is headed for a devastating economic contraction unless oil prices recover. It's a short sighted, desperate strategy, as a weak dollar may cause an even weaker demand for crude in the long run. Realizing that, Russia's Finance Minister Alexei Kudrin was recently allowed to make this statement: "It is hard to say that in the next few years this [dollar based reserves] system will change significantly." So if bringing down the dollar doesn't work, let's try some geopolitical shenanigans such as the Nigeria oil platform attack a few days back. Doesn't cost much to pay a few guys to fire some shots at an oil platform.